Directions for cake: Preheat oven to 350 degrees. 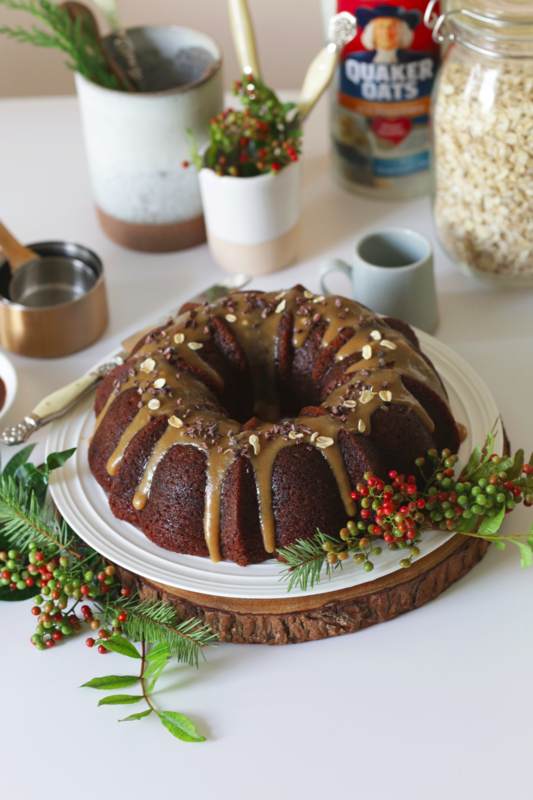 Grease 12-cup bundt cake pan. In a mixer, beat oil and sugars together. Add eggs, bananas, and vanilla. Combine baking soda, salt, oats and flour. Add 1/2 to batter and incorporate. Then add half of the buttermilk. Alternate until all ingredients have been incorporated. Bake 60-75 minutes, or until a toothpick inserted comes out clean. Directions for glaze: Melt butter and add brown sugar. Stir constantly over medium-low heat until sugar dissolves. Add dulce de leche, sea salt and vanilla. Turn heat off and add powdered sugar. Immediately pour over cake. Garnish with toasted oats and cacao nibs, if desired. Yum!! Caramel and banana are made for each other! This recipe sounds so amazing! !